Connecticut stands on the cusp of an unprecedented fiscal crisis. The budget that Gov. 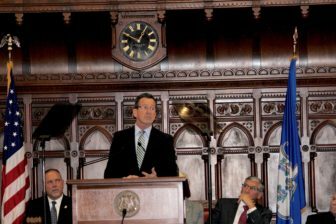 Dannel P. Malloy will present to the legislature Feb. 8, in an attempt to close $3 billion in deficits over the next two years, is only a portent of a far greater, long-term challenge facing the state. Simply, the bill is coming due in ever-increasing amounts for the 80-year failure of one of the richest states in the nation to adequately save for retirement benefits promised to teachers and state employees. Hobbled by debts accumulated by generations of governors and legislators, Connecticut for at least 15 years to come is likely to face a bleak and politically dangerous menu of options that could shape the state’s economy and quality of life. The cost of paying down $50 billion in unfunded retirement benefits, plus other state debt, is eating a growing portion of the budget, squeezing funding for transportation, education, social services and, perhaps next, state aid for municipalities. Even if legislators ratify a new plan Wednesday to spread out surging payments for state employee pensions, the costs for teachers’ pensions and a massively unfunded retiree health care program still threaten to consume unprecedented portions of the state budget. And that leaves lawmakers with unpalatable choices. The challenge is compounded by Connecticut’s economic recovery, which lags not only the nation’s, but past turnarounds here. State officials have raised taxes three times in the past eight years, and they are struggling to avoid another round. Tax increases are strongly opposed by the state’s business community and others, who say they create a poor business climate and are a drag on economic growth. Also, since the last recession, income tax increases — the only revenue engine large enough to make a substantial dent in the long-term problem — haven’t delivered the revenue growth for which state officials have hoped. Alternatively, given the large portion of the state budget devoted to fixed costs, large discretionary spending cuts will be increasingly painful, threatening services many residents rely on and investments in the state’s future. As part of the solution, leaders from both parties are calling for concessions from today’s public workers to help make up for the poor decisions of the past. This has put labor unions, a key constituency of the Democratic Party, which has dominated the General Assembly for more than three decades, at odds with their allies. The rich, the unions say, aren’t paying their fair share of taxes and state officials should look there for help, not to the unions’ middle-class members. Malloy insists his administration is not to blame for the painful choices facing Connecticut. 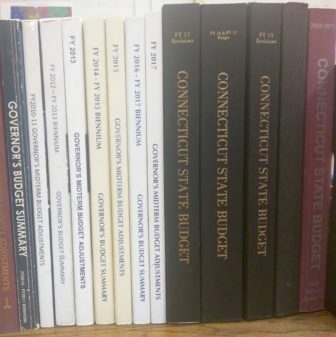 “Most people out there think I’ve increased spending dramatically for what they otherwise would consider to be optional expenditures, and nothing could be further from the truth,” Malloy told Capitol reporters back in mid-November as he first began to discuss the next two-year state budget. Connecticut’s history of not saving for the retirement benefits it promised public-sector workers — which dates back to 1939 — has gotten increasing attention over the past two years as Malloy, who campaigned for re-election on predictions of a balanced budget and pledges to avoid tax hikes, did not deliver either. At the same time, officials began to focus on the cost of fixing a budget system that has run up $74 billion in unfunded retirement benefit obligations and bonded debt. In other words, what would it take for Connecticut to pay the bills of past generations — inflated badly over time — while saving for present-day workers’ retirement benefits so future taxpayers aren’t saddled with them. That question has become more pressing as state government runs out of options to pass costs onto the future. Twenty years ago, those four line items composed 12 percent of the General Fund. Next fiscal year they will consume 31 percent. And the speed with which they gobble up the budget is accelerating. In the 2010-11 fiscal year, just after the last recession ended, those costs stood at just under $3.3 billion. Since then they’ve averaged 10 percent growth per year, and now approach $5.6 billion. General Fund tax receipts over the same period swelled by less than 4 percent per year on average. And that takes into account major tax increases ordered in 2011 and 2015. If those growth rates are daunting, things get worse going forward. Revenue growth is expected to stay close to 3 percent per year, at least into the early 2020s — unless the nation slips into recession, according to state analysts. Conservative economists and Connecticut’s business community say revenue growth might accelerate, but only if the state can find a way to freeze its spending and avoid tax hikes for several years – two things the surging benefit costs won’t accommodate. According to a study by the Center for Retirement Research at Boston College, both annual contributions to state employees’ and teachers’ pensions are on pace to more than quadruple by the early 2030s, placing both above $6 billion per year. They are about $1.6 billion and $1.3 billion, respectively, next fiscal year. The teachers’ fund contribution potentially faces a 365 percent increase over 14 years, or an average annual jump of 26 percent. Why does the problem peak in the early 2030s? Analysts say that’s when Connecticut will have caught up on all obligations of the past — and many retirees from the period when state government didn’t save will have died by then. The Boston College forecasts also are based on the assumption that pension fund investments will average an annual return of 5.5 percent over that period. And while the Connecticut assumes an 8 percent rate of return across a 30-year period, as many states do, officials here and nationwide are acknowledging such assumptions probably are inflated and unrealistic. Critics in financial services and academic circles have argued that, since the last recession began, a better target is closer to 3 percent or 4 percent, pointing to the yield on long-term U.S. Treasury bonds. Moody’s Investors Service proposed a new methodology in July 2012 that used the return of high-quality corporate bonds as its new guideline, noting that their average yield was 5.5 percent in 2010 and 2011. Based on the Boston College projection, state employee pension costs would grow by 326 percent over the next 14 years, an average jump of 23 percent per year. But Malloy says his new deal with the unions, which the legislature is expected to decide Wednesday whether to ratify, would take the sting out of that problem — albeit at a hefty cost. Connecticut would lower its assumed investment return to 6.9 percent and still would see its state employee pension contribution rise to $2.2 billion by 2022. But it would remain close to that mark for another 12 years, avoiding the $6 billion annual spike. To get that relief, though, Connecticut would ask a future generation to pick up at least $14 billion of today’s obligations after 2032. Gov. Dannel P. Malloy gives his State of the State speech as legislative leaders from each party watch behind him. But does it make the overall budget “predictable” or, more importantly, stable? Even if already hefty state employee pension contributions grow at a slower pace, the other hot spots in the state budget still surge enough to cause major fiscal disruption. When the prospect of a $6 billion annual contribution — to either the state employee or teacher pension program — first was raised in late 2015, Malloy’s budget chief, Office of Policy and Management Secretary Ben Barnes, made it clear even one spiking payment was dangerous. Defending his state employee pension restructuring plan last week, Malloy said even his critics concede state finances couldn’t support the annual payments that system otherwise would require. “None of them are saying that the state could ever afford $4 billion to $6 billion” per year, he said. But that is exactly where Connecticut’s other major pension program, the fund for municipal teachers, is headed — north of $6 billion per year around 2032. More importantly, Connecticut cannot shift teachers’ pension costs onto future generations — even if officials were inclined to do so — for another 17 years. According to an opinion from the state’s bond counsel, the state signed away any ability to defer contributions to the teachers’ pension system when it borrowed $2 billion to bolster the teachers’ pension fund back in 2008. The Hartford firm of Day Pitney wrote any deferral of payments into the teachers’ pension would violate guarantees Connecticut built into the covenant with bond investors. And that guarantee was good for the 25-year life of the bonds. “It was and remains essential that the state reverse the trend of shorting its payments, and that the teachers’ fund make progress toward near or full funding within a fixed period of time,” Nappier said when the opinion was released last June. Comptroller Kevin P. Lembo, one of the most vocal advocates for a more holistic assessment of Connecticut’s finances, said the state employee pension restructuring is a step toward predictability, and not the solution by itself. Further complicating matters, Connecticut has no legal leverage to secure concessions from workers who’ve already retired. And 80 percent of the annual payments into both pensions are to correct the fiscal sins of the past, not to cover the cost of today’s workers. Did poor savings habits cause the CT income tax? Nappier has been warning for years that Connecticut’s poor history of saving for retirement benefits would pose huge challenges over the next 15 years. Connecticut saved nothing between 1939 and 1971 — and very little until the mid-1980s — to cover pensions promised to state employees and teachers. For example, between 1979 and 1988, the state never contributed more than 40 percent of the recommended payment for the teachers’ pension. Arguably, the state’s response to this four-and-a-half decade long problem contributed greatly to enactment of the state income tax in 1991. Between 1984 — right before Connecticut created a new tier of less lucrative retirement benefits while increasing its contributions to the employee pension system — and 1990, the General Fund grew by 76 percent, from $3.6 billion to $6.4 billion. The single-biggest cost driver over that period: contributions into the state employees’ and teachers’ pensions, which combined grew a whopping 119 percent. That problem, coupled with an expensive new initiative to increase municipal teachers’ salaries and a painful recession that began in the summer of 1990, left state government with a fiscal crisis that ultimately would be resolved in August 1991 with enactment of the income tax. And once the income tax was in place, the focus on both parties was not on making pension contributions. For example, contributions to the teachers’ fund between 1992 and 2007 averaged 75 percent of the full recommended level. Throughout most of the 1990s and 2000s, legislatures and governors routinely contributed less than the full amount recommended for pension funds, and further weakened those systems by often paying senior workers incentives to retire early. That maneuver offers a short-term savings to the budget, but drains more resources over the long haul from the pension system. And once the income tax was in place, and Connecticut was experiencing good economic times, saving in general was not a priority. State government ran up $6.1 billion in budget surpluses between 2000 and 2014, according to nonpartisan analysts. Only one-third of it, $2.1 billion, was placed in the budget reserve. The rest was spent. “The financial IQ — and I include myself in this so I’m not pointing fingers — wasn’t there in the 1990s,” Ward said. While state officials now may be more focused than their counterparts 20 years ago, there still is no long-term solution for retiree health care, the worst-funded of all of Connecticut’s retirement benefit programs. The state essentially saved nothing for this benefit until 2009. For decades, governors and legislatures placed responsibility for the retirement health care costs of their generation’s workers on future taxpayers. Not surprisingly given medical inflation and the growing size of state government, each decade left behind larger retiree health care obligations than the bills they inherited and paid out. And state government is still making the problem worse now. Connecticut needs to set aside an amount equal to 14 percent of payroll each year to cover retirement health care promised to today’s workers, according to Malloy’s budget office. Employees now contribute 3 percent of their pay toward that effort, and next fiscal year the state will begin matching that. That still amounts to less than half the money needed annually to cover the full cost. The future must find the rest. And Connecticut already has inherited 19 billion in retiree health care obligations from past budgets. In other words, it is simply adding to the problem at a slower rate than it did in the past. Although the state rarely projects retiree health care expenses many years into the future, one panel tried to calculate the cost of all bills in this area. The Post Employment Benefits Commission, a 2010 study group appointed by Gov. M. Jodi Rell, estimated the cost of paying all past bills while saving the full amount annually for present-day workers would come at a very steep price. Connecticut, which will spend almost $800 million next fiscal year on retiree health care, would have to pay more than $1.15 billion under the study panel’s plan. From there the bill would rise rapidly, nearly quadrupling to $4.4 billion by 2032. If retiree health care and debt service costs grow in the future as they have since the last recession, that — coupled with an exploding teachers’ pension payment and a tempered contribution into the state employees’ fund — would have retirement benefit and debt costs rising about 10 percent annually for the next decade and a half. Should CT stop guaranteeing retirement benefits? That’s still three times the rate of revenue growth Connecticut is anticipating in the next few years. State employees rally outside the Capitol last March to protest threatened layoffs and requests for givebacks. Lembo said he is optimistic that an employee/retiree wellness program could be expanded to cut health care costs, but also conceded that medical inflation is a volatile factor that is difficult to project. The Malloy administration is in talks with state employee unions, and the governor’s budget director said the state must try to reduce the cost of retiree health care. The state has one health and retirement benefits contract with all unions, and that deal runs through 2022. 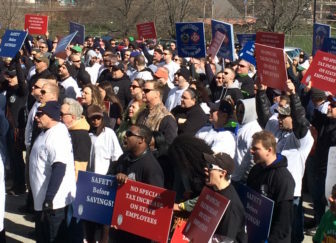 And union leaders have said it’s unfair to ask today’s workers to grant concessions because Connecticut didn’t prepare to fund the retirement benefits it owes now. 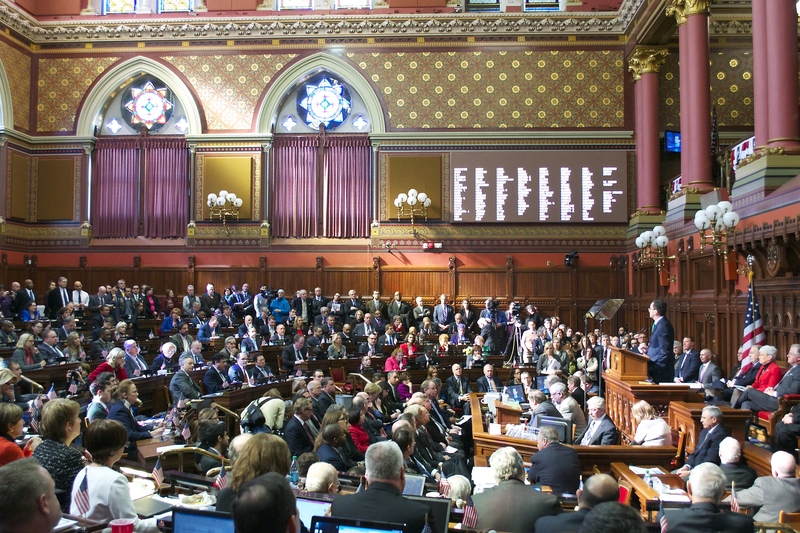 The top Republicans in the House and Senate, Themis Klarides and Len Fasano proposed a different strategy last year — Connecticut should commit now to ending its longstanding practice of guaranteeing benefits by contract. The alternative would be to establish benefits only in statute, meaning they also could be eliminated quickly by amending the law. “We have got to get out of this, ‘This is how we have always done it’ mentality,” Klarides said at the time.